Weak Colors (or Simple Colors + Hinge) extends either end of a Simple Colors chain using Hinges or Empty Rectangles considerations. The cells seen by the end of the starting chain are all lightly shaded in the opposite colour. If a single cell now sees a complete set of lightly shaded cells in a unit, it can only be true if the terminal cell is true, and is given the same color (a bonus cell). Any cells seeing a newly created bonus cell can also be lightly coloured in the opposite color and the scheme continued. Bonus cells can only be created in the color of the terminal cell they stem from (as the true-together guarantee is lost for the opposite colour). The same deductions available from Simple Colors are now available. The starting chain can be as short as one conjugate link. With practice, it is often unnecessary to use the light shadings to check for the presence of a bonus cell. If there is more than one possible single colouring chain, the method should be repeated for each one, when it produces nearly all the exclusions found by Multi-Colors. The difference is that this method is non-bifurcative, as only one un-branched chain is involved at any time. The method predates X-Colors, which is an extension of the same principles to provide Nishio deductions by allowing multiple branches. So, repeated application of Weak Colors will not find all the exclusions provided by X-colors. This diagram gives the marking order for an extended example. In column 7 the conjugate pair X-Y have been coloured strongly. From X the colouring is extended through 3 hinges to give bonus cells A, B & C which must be true when X is true. 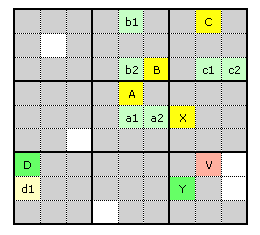 First a1 & a2 are lightly shaded in green, as one of them must be true if X is false. As A is the only remaining cell in box 5 it can therefore be given the same colour as X. The logic continues: A -> (b1 & b2) -> B -> (c1 & c2) -> C. From the green cell, Y, we also get Y -> d1 -> D, but note d1 cannot be strongly coloured even though it is conjugate with D, as although D must be true when Y is true, it may still be true even when Y is false. The red victim cell, V, can now be excluded according to the usual single coloring rules. It is seen both by strongly coloured yellow (C) and green (Y & D) cells, and one of these two sets must be true. To avoid being bifurcative, each exclusion should reportable as a single unbranched chain of inferences (and so could be written as an AIC). Copyright © 2007 Sudoku9981.com All rights reserved.